Aurora 1966 Illya Kuryakin 412 man from uncle instructions sheet FREE SHIPPING. No other parts are included. Don’t see the part you need?. If you HAVE. Box is nice.light wear on the corners/edges etc. It's been painted in spots, you can always repaint it. COMIC SCENES. INSTRUCTION BOOKLET / COMIC. Dated 1974. I would grade this booklet as VG. There are small corner. Maker: Aurora Comic Scene. Year Made: 1974. Item is new but box has wear from age. Plastic factory seal is coming apart and box on bottom. T his is a resin copy of the owl that appeared in the 1964 issue of the Aurora Batman model kit. It was only in the original issue of the kit, not in the subsequent comic scenes, Monogram or Revell issues. The box top has very minor "crushing," with a few small creases, but displays very nicely. All pieces look to be accounted for along with the instruction book. The one blemish on the kit is the pen drawing on the bottom of the box. BATMAN'S BATMOBILE vintage Aurora instruction sheet only from 1966 model kit. 8 1/2 x 17, one single large page front and back folds to 8 1/2 x 11. Fine condition. Folded in half as originally issued. From the original owner who has had this since 1966. The instruction sheet only, not the model kit itself. This RARE 1967 unbuilt BATCYCLE from Aurora is in super condition. The beautiful picture box with fresh colors and minimum wear is solid on all 4 corners. More than just a pretty picture. Aurora 1966 Robin the boy wonder 488 instructions sheet FREE SHIPPING. BATMAN'S BATBOAT vintage Aurora partial decal sheet only from 1967. BATMAN'S BATBOAT incomplete decal sheet from 1967 (shown below). The partial decal sheet only shown below. Nothing else from the kit. This is a resin recast shield for the Aurora Viking. No other parts are included. This is a resin copy of the Tarzan knife and sheath. This is for both the original or the comic scenes version, often missing. You will get both the knife and sheath, no other kit parts are included. Aurora 1966 Batplane 487 instructions sheet FREE SHIPPING. 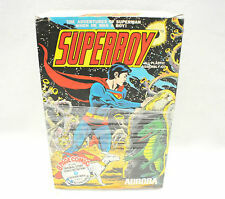 Superboy Aurora model kit.Box is in great condition. Model is Painted, incomplete. COMIC SCENES. INSTRUCTION BOOKLET / COMIC. Dated 1974. I would grade this booklet as VG. There are bends on the. THE AMAZING SPIDER-MAN. This is for both the original or the comic scenes version, this will not fit the Polar Lights reissue. No other kit parts are included. BATMAN'S BATPLANE vintage Aurora instruction sheet only from 1966 model kit. BATMAN'S BATPLANE instruction sheet from the 1966 model kit (not from any reissue). 8 1/2 x 17, one single large page front and back folds to 8 1/2 x 11. Fine condition. Folded in half as originally issued. BATMAN'S BATBOAT vintage Aurora instruction sheet only from 1967 model kit. BATMAN'S BATBOAT instruction sheet from the 1967 model kit (not from any reissue). 8 1/2 x 17, one single large page front and back folds to 8 1/2 x 11. Fine condition. Folded in half as originally issued. BATMAN'S BATCYCLE vintage Aurora instruction sheet only from 1967 model kit. BATMAN'S BATCYCLE instruction sheet from the 1967 model kit (not from any reissue). 8 1/2 x 17, one single large page front and back folds to 8 1/2 x 11. Fine condition. Folded in half as originally issued. See pic for an example. The picture shows size as well. Batman figure from the Aurora Batmobile model kit. This is just the figure, no arms. Multiple art pages can easily be combined because they are light and thin. For instance, two statues require a much bigger box. A RUN will be a collection of consecutive issues with no breaks in between them.